Fferm Penglais: En-Suite Accommodation01970 621960work Campus AccommodationFferm Penglais offers you the very latest in purpose-built en-suite campus accommodation. This new residence provides a superb environment with generous en-suite bedrooms and high specification studio apartments, including hard wired and Wi-Fi internet access. Individual en-suite rooms, based in self-catered flats of 6 or 8 with shared kitchen facilities. Fferm Penglais has an on-site shop offering low cost convenience items such as, fresh bread and milk, frozen foods, toiletries and cleaning products. 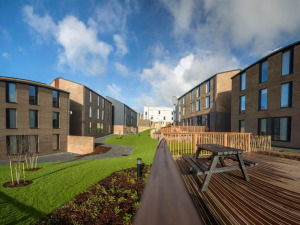 Fferm Penglais offers you the very latest in purpose-built en-suite campus accommodation. This new residence provides a superb environment with generous en-suite bedrooms and high specification studio apartments, including hard wired and Wi-Fi internet access. A discount is available if the whole flat is rented.